Washington, D.C.-(ENEWSPF)- Using biofuels to help power jet engines reduces particle emissions in their exhaust by as much as 50 to 70 percent, in a new study conclusion that bodes well for airline economics and Earth’s environment. Contrails are produced by hot aircraft engine exhaust mixing with the cold air that is typical at cruise altitudes several miles above Earth’s surface, and are composed primarily of water in the form of ice crystals. 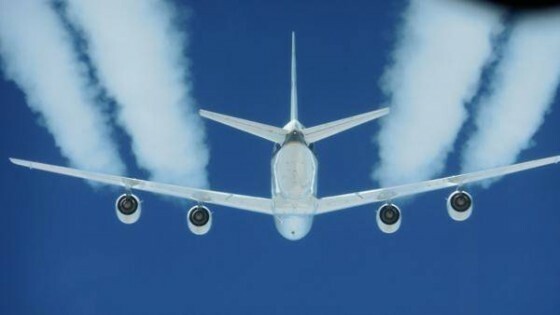 The tests involved flying NASA’s workhorse DC-8 as high as 40,000 feet while its four engines burned a 50-50 blend of aviation fuel and a renewable alternative fuel of hydro processed esters and fatty acids produced from camelina plant oil. A trio of research aircraft took turns flying behind the DC-8 at distances ranging from 300 feet to more than 20 miles to take measurements on emissions and study contrail formation as the different fuels were burned. “This was the first time we have quantified the amount of soot particles emitted by jet engines while burning a 50-50 blend of biofuel in flight,” said Rich Moore, lead author of the Nature report. The trailing aircraft included NASA’s HU-25C Guardian jet based at Langley, a Falcon 20-E5 jet owned by the German Aerospace Center (DLR), and a CT-133 jet provided by the National Research Council of Canada.